At CRF Health we understand that the data collection needs of investigator sites and patients are varied and complex. At CRF Health we understand that the data collection needs of investigator sites and patients are varied and complex. The demand for eDiaries for the collection of Patient Reported Outcomes (PRO) data has increased, and so too have the questionnaire requirements. As a result, larger sized screens are required for certain site-based clinical trials. We have extended our TrialMax® and TrialStudio® to support Tablet PCs running Windows Vista®. 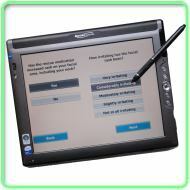 TrialSlate's larger screens allow more complex questionnaires to be completed with ease. The flexibility of stylus and touch screen allow for more natural information entry, simple navigation as well as brilliant color and clarity for easier reading and usability.